The Roman Bridge over the River Wye, Hereford. 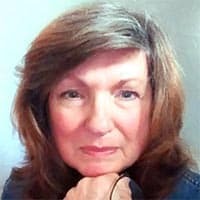 Mary Charlebois photos. 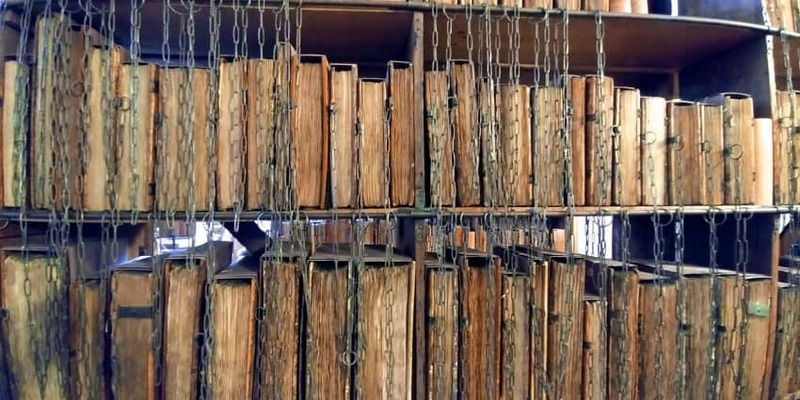 A library where books are chained to the shelves is guarded in Hereford Cathedral. Down a corridor of Norman Columns, the Mappa Mundi mesmerizes onlookers. A 1217 copy of the Magna Carta is displayed on special occasions. Hereford is more than a cathedral, ancient documents, and a breed of beef-cattle enjoyed the world over. 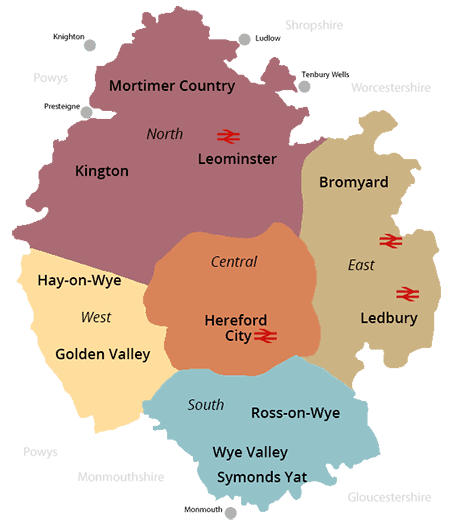 It’s a city in the county of Herefordshire England, 16-miles from the Welsh border. It’s been a place of settlement along the River Wye since the Bronze Age. Part English, part Welsh, town and village names reflect the ever-changing boundary between England and Wales. The same is true of food, art, music, folklore, and language. Farm stand with honor box. Herefordshire is a quilt of fields, livestock, farm buildings, and woodlands. Narrow country lanes are bordered by hedgerows and stone walls. Beyond the centuries-old barriers are farms and fields. Fields are golden with grain, or green with potato leaves, asparagus, and corn. Apple, plum, and pear orchards flourish. 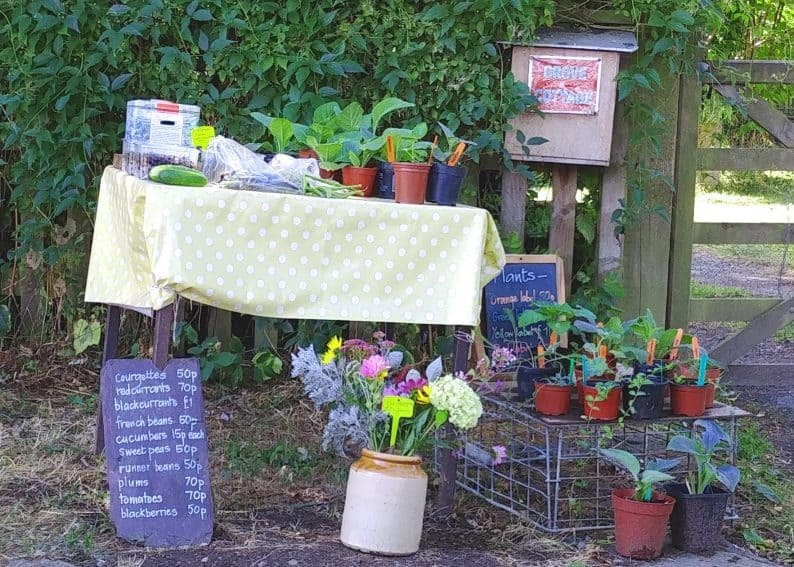 An occasional farm stand offers fruit, vegetables, honey, or eggs you pay for in an honor box. Cattle graze, sheep forage, horses wander. You pass micro-villages, stone cottages, pubs, and shops. Patches of woodlands cover hillsides. Occasionally the River Wye rolls under a one-lane, arched-stone bridge. Like most of England, history runs deep and is proudly sustained. This beautiful area will introduce you to England’s heart, its people and their land. Home to Mappa Mundi, Chained Library, Cathedral Tours, and Even Song. The splendid Hereford Cathedral has been a site for worship since the 8th-century. The architecture covers several eras, including Norman. A 13th-century calfskin map of the world has been safeguarded for 100s of years. Mappa Mundi has toured the world. The Chained Library at Hereford Cathedral. 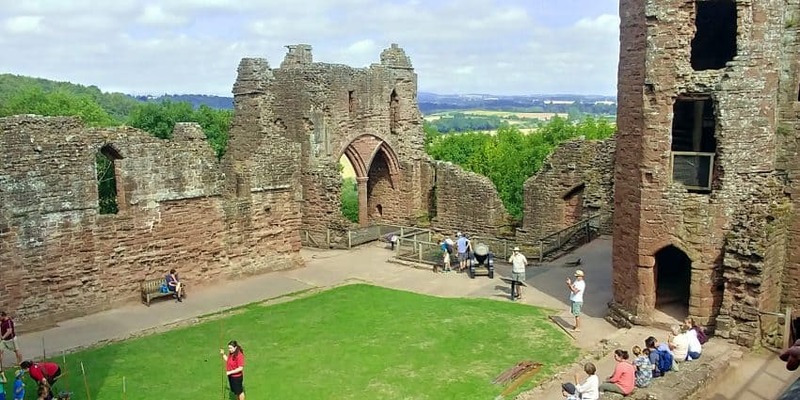 Goodrich Castle courtyard overlooking the Wye Valley, Herefordshire. Kilpeck Church—Church of St Mary and St David—is a Romanesque church and has been a place of worship for over 900-years. It’s extraordinary and very rare. The place of worship has symbols and icons from Pagan and Christian beliefs. Two walking tours of Hereford have been mapped out. The Historic City Walk takes you to the old town area, passing through the Butter Market, black and white timber houses, and around the cathedral. The Riverside Walk takes you along the River Wye crossing over and under bridges. The Roman Bridge and Victoria Bridges are exceptional photo ops. Maps are available from the Castle House Hotel Concierge. 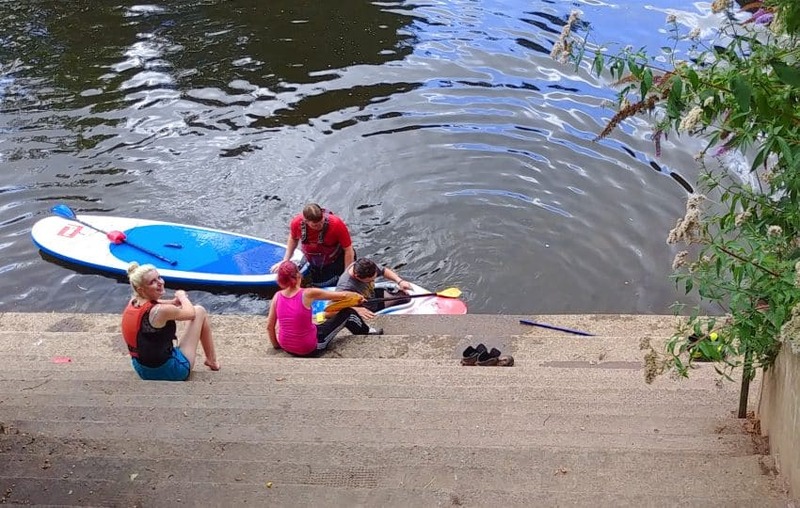 SUP on the River Wye, Hereford. 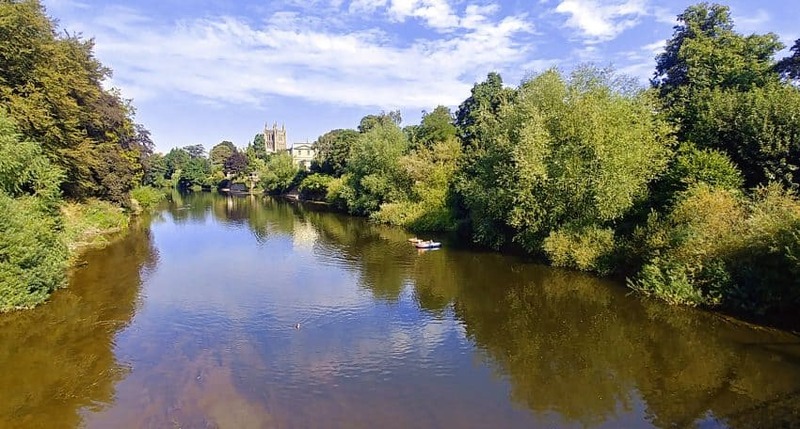 The river Wye is canoe and kayak friendly. The scenery is a combination of woodlands and riverside homes and businesses. Tie-up at a pub and take a cider break. All that remains of the 12th century, Hereford Castle, is the moat that borders the terraced garden. The bucolic setting is flawless for long, lazy lunches, afternoon tea, or sunset bubbly and dinner. 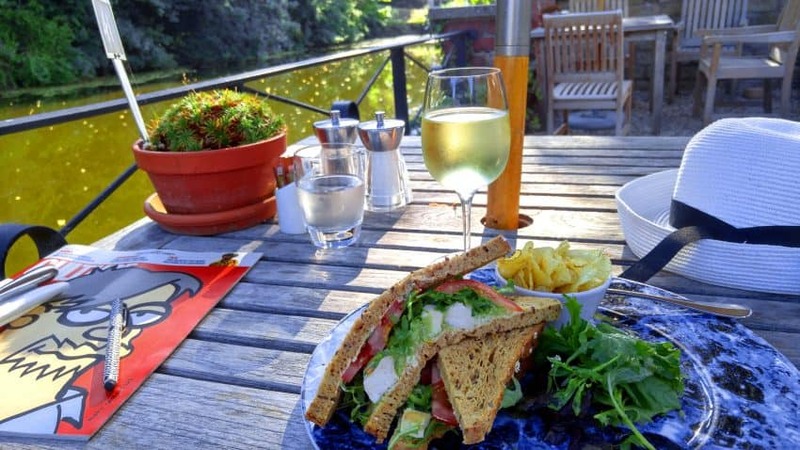 Lunch on the terrace by the Castle House Moat, Hereford. The freshest local ingredients served in the area come from 10-miles away. Castle House kitchen is supplied by its own farm, Ballingham Hall. Ballingham Beef, raised only at Ballingham Hall, and organic fruit and veg fill the seasonal menu. This is a great article! I’ve always longed to go to England, and your descriptions and pictures just fan the fire. Thanks for sharing. Thank you for sharing your England dream. I say – GO NOW! I dreamed about an England journey for years, the trip was all and more than I expected. When you’re ready to go, I’m happy to share some of my favorites and tips. Great blog. Thanks for sharing and keep it up..